Congratulations to our own Hannah Rae on her very successful representation and participation in the NAfME All-National Honor Ensembles. 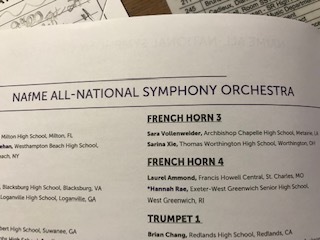 Hannah was one of only 550 of the most musically talented high school students in the United States to perform in the 2018 All-National Honor Ensembles. With the assistance from Mr. Charest, Hannah prepared "momentously challenging music" that they performed under the leadership of prominent conductors. In Hannah's case, she performed under conductor, Dr. Jean Montes.